Today’s is Prince’s Birthday, and Governor Dayton has declared today is Prince Day in Minnesota in honor of our local legend. Six weeks ago as I was getting ready to speak at a Rotary group, we were receiving news that someone had been found unresponsive at Paisley Park in Chanhassen, MN. We sat on the edge of our seats for hours, hoping it wasn’t actually Prince. However, the tragic news would later confirm our fears….. we had lost our purple legend. Those of you who aren’t from Minnesota might not quite get the full impact of what we felt. This was a HUGE loss for us, and it shook us to our core. Prince was born and raised in Minneapolis, and chose to stay here and build his Paisley Park empire. I used to drive by it all the time when I lived in the suburbs….. it’s nondescript even though it sits right at the road, and no one would be the wiser to whom lived and recorded music inside. Prince could have lived anywhere in the world, yet he called Minnesota HOME. This entire week was been filled with mourning for local legend. 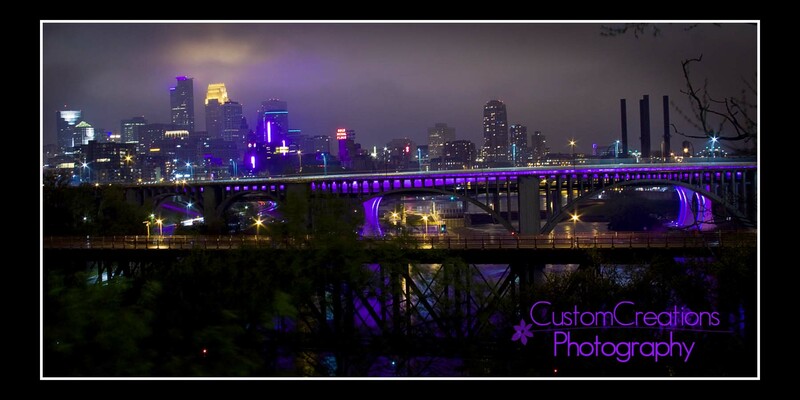 Our sports teams all paid tribute to him at their home games, Target Field lit up in purple and played a screening of “Purple Rain” and the Twins released seven doves at their next game; the Wild held a moment of silence and had a purple laser show; corporations turned the Minneapolis skyline purple; First Avenue (home of the movie “Purple Rain”) held all-night dance parties in his honor; theaters showed screenings of “Purple Rain”; and Governor Dayton ordered the 35W bridge to stay lit up in Purple. While I never met Prince personally, or even attended one of his concerts, I had mad respect for his music and talent. He was a mysterious guy and kept to himself, he expressed himself through his music he literally forged a path all his own. I have enjoyed watching many of his performances on Youtube this past week, with tears running down my cheeks …. we truly lost a talented legend. He had suffered from childhood epilepsy which caused him to get bullied, so he turned to music and flamboyant clothing and acts to express himself. He is one of the few celebrities of our time that lived in such a quiet, personal bubble and had essentially zero “dirt” on him. He stuck up for the underdog and was an advocate of the arts. Other musicians have been paying tribute to the mighty Prince at their concerts this week, which speaks volumes to how much of an influence Prince truly was on the music industry. His presence will be missed all around the world, however, here in Minnesota, we are taking his loss harder, more personal. I felt compelled to take my camera and record the moment in time, it felt like something I had to do. My friend Jill drove as we tried to navigate the dark streets of Minneapolis in the pouring rain. We were just about to give up, as we couldn’t quite find the spot we were looking for and the rain was relentless. As we were making our final pass on the U of M campus we missed the turn we needed. I told Jill to veer left in an attempt to turn around, but when we turned the corner — the view literally took our breath away ….. and the rain ceased. I believe this was Prince guiding us to the perfect spot!! This photo is my tribute to the purple one, and was featured on National Geographic’s site as well as it was also trending on social media. I am quite thrilled with how it turned out, and believe that Prince would definitely approve…. not only of my image, but of the mad respect and love that Minneapolis has shown him. $7 shipping will be added to your order at checkout.